Topics: Institutions, Instructors, and Students. On average 2.30 pages are viewed each, by the estimated 655 daily visitors. The programming language environment is ASP.NET. 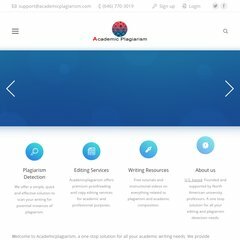 Its 2 nameservers are ns1.academicplagiarism.com, and ns2.academicplagiarism.com. It is hosted by Turnkey Internet Inc (New York, Albany,) using Microsoft-IIS/6 web server. PING (67.231.242.243) 56(84) bytes of data. Pinging the server, resulted in a 32.1 ms response.